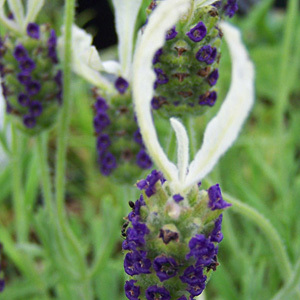 This unusual selection of Spanish lavender was introduced by the Van Hevelingen Nursery. The green flower heads have rows of dark purple corollas and are topped by ivory-white bracts. Spanish lavenders have a piney lavender scent and the growth is often a bit sprawling. Categories: all potted plants, deer resistant, lavender plants, Potted Plants, More..